I survived my first author event and it was fun! On January 19, my first book reading took place at Village Frame & Galley which is located in a lovely Portland neighborhood called Multnomah Village. Lura and I arrived to find chairs had already been lined up in neat rows by our host, Beth, a nice and gentle lady. 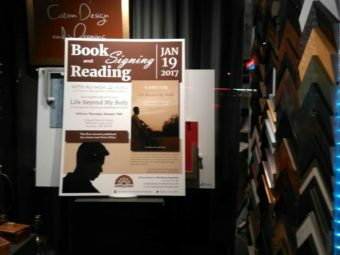 The poster for my book reading was displayed in the warmly illuminated show window among delicate frames, pictures, and art works. I was drawn to the sidewalk to take a careful look at it before the audience came. I thought of the days when I worked on the manuscript in the scorching weather of Guangzhou where I sat at my desk in my room, stripped to the waist, gazing at the tossing trees out of my window. For a long while I couldn’t think up a single word to put on the paper set before me. In those days, I would wake up with a start from a daytime nap and think, “What are you doing? Everybody is working, while you hardly make a living, yet you think you are a genius who can write a book?” What a luxurious thing for a poor man to put aside everything and focus on one thing that has no guarantee. On January 19th, standing on a foreign street with that poster in front of me, for a moment I thought I was in a dream. Yet everything was real and beyond what I could dream up. Dear friends, if you are undergoing hardships in the process of working on something, don`t give up! Beautiful things will happen because of your perseverance. I felt I must take a picture for a keepsake. Two ladies with a dog passed by. They looked back curiously at the poster. I said to them merrily, “That`s me!” Then they realized what I was doing and said so. Previously, I had worried about the Q & A session. I imagined there would be challenging questions that I would not be able to catch or answer properly. But the questions people asked showed they were concerned about me and wanted to help, which made it like talking with friends, which is an enjoyable thing to do. Finally, someone asked, “May I buy a copy?” and the Q&A session transitioned to a book signing. People came up to the table where I was sitting, shook hands with me, and said, “Thank you for sharing your story. You are very courageous.” I remembered the names I signed, the eyes I looked into, the words spoken to me — I tried to remember everything. Thank you to all who came and witnessed my first book reading! It’s scary to be in a new place, to meet strange people, and to do something you are green at, but it can be also by surprisingly enjoyable once you step out. This is turning into the biggest opportunity of my life. 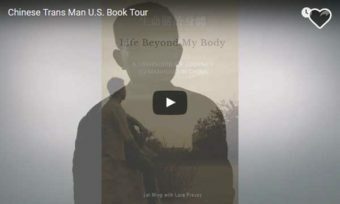 I have been invited to a number of other cities to share my story. This is an amazing chance for me, because I will also get to meet and hear the stories of other trans people. All my life, I have wished for friends and mentors who are trans so I would not be the only trans person I know. Now I have the chance for that to come true in a bigger way than I ever dared dream, but I need your help. Some of my travel expenses are being covered and trans men are opening their homes to host me while I am on the road, but I need to raise some of the required funds myself. Click to learn more about why I need to raise funds. Donate to my online fundraiser at GoFundMe. It doesn’t have to be a huge contribution — lots of little donations add up. Forward this email to your friends along with a personal message asking them to donate. Share this blog post and the GoFundMe page on all your social media. Thank you, my friends. It’s humbling to ask for help, but I only have this limited time in America and I want to make the most of this chance. Ultimately, my goal is to write a second book that includes what I learn during my travels, but I’ll be blogging about this adventure first, so if you are not signed up for my newsletter, do that now.